AutographsForSale.com was launched in 1999 and is still owned and operated by former Upper Deck Authenticated Product Manager Theo Chen, one of the most successful in person autograph collectors AND modern sports autograph experts in the world. Many of the autographs on this site are from his personal collection, which he started in the late 1980s. He worked for Beckett Media for almost 10 years prior to joining UDA in 1998, and has written nearly 200 published columns and feature stories about autographs, sports cards and collectibles for Beckett Publications and Junior Baseball Magazine over the years. He has been quoted by the New York Times and the National Post among many newspapers and other publications. He was the top rated Autographs Expert on AllExperts.com (now defunct). In 20 years of selling to well over 10,000 different customers around the world, AutographsForSale.com has NEVER received a SINGLE unresolved Better Business Bureau complaint earning us a BBB rating of A and are Bizrate Customer Certified. 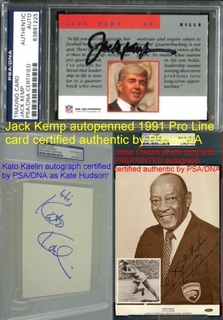 Many competitors sell fake autographs, especially on Amazon (which doesn't care about authenticity). Authenticity is my #1 concern. I stake my reputation on every autograph I sell. Every autograph you see here was obtained 1) in person by me or one of my representatives; 2) at a paid signing by a company such as Creative, Mounted, Schwartz, Steiner, TriStar or UDA; or 3) purchased from a trusted source that was extensively scrutinized. Many of the autographs offered here are from my personal collection. I won't sell any autographed item unless I am certain of authenticity! A written certificate of authenticity is provided with each autographed collectible, as required by law. All autographs are guaranteed authentic for LIFE. Each autographed item is accompanied by a Certificate of Authenticity (COA) from AutographsForSale.com and/or the company that authenticated, obtained or witnessed the signature. If you provide a written opinion from the celebrity's agent, estate or team that your autographed item is not authentic, I will provide a full refund. However, opinions from third party authenticators (particularly Global Authentics and PSA/DNA) are generally NOT ACCEPTABLE for refund. Please see above for three glaring examples of PSA/DNA mistakes. AutographsForSale.com partners with James Spence Authentication (JSA) for customers who desire third party authentication. E-mail for availability, cost and time frame for this service. Also see Hauls of Shame or the numerous Ripoff Report complaints about PSA/DNA or this detailed analysis of extremely questionable Derek Jeter GAI autographs or this article about fake GAI Mickey Mantle, Joe DiMaggio and Ted Williams autographs. NOTE: The few dozen autographed items offered here with PSA/DNA authentication were mostly witnessed and authenticated at paid signings. Unlike many of our competitors, at AutographsForSale.com I sell only REAL AUTOGRAPHS. If a competitor's price seems too good to be true, BEWARE! Fake autograph sellers use many tricks, including stealing images of real autographs from sites like this and shipping forgeries instead. Amazon in particular is notoriously flooded with fake autographs because they have no authenticity policy. Amazon collects fees from every item sold, real or fake, so they have an incentive to allow fakes to be sold on their site. Amazon accounts can be closed and opened in a matter of minutes, which allows forgers to hide their tracks. Positive feedback from customers may only mean that the seller has successfully fooled unsuspecting buyers. AutographsForSale.com has been in business since 1999 and over 92% of previous customers rated us Excellent or Good. Every autographed item you see here is IN STOCK AND READY TO SHIP IMMEDIATELY. If you have a question about a product, whether it's about authenticity or anything else, I can answer it without having to call some other company.